THE LEAD PROSECUTOR in the Michaela McAreavey murder trial told the court in Mauritius today that the two men accused of the killing had committed when he called a “barbaric act”. In a closing speech lasting an hour an a half, the prosecutor told the nine-member jury that it had been “one of the most difficult trials” he had ever faced. 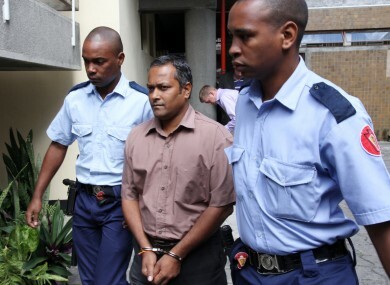 In a packed courtroom of the Assizes of Mauritius on the 30th day of the trial, Mehdi Manrakhan told the jury that they should not judge the actions of the police in the case but focus on the two accused men, Avinash Treebhoowon, a former room attendant at Legends hotel and Sandeep Moonea, a former floor supervisor in the hotel where the McAreaveys had spent part of their honeymoon. The prosecutor said that the defense had tried to argue that the confessions from the accused had been obtained by force and that there was no DNA or fingerprints from the two accused men in the room where the crime happened. Manrakhan said that these arguments had been ruled out during the trial, partly due to the findings of the forensic medical officer, Dr Gungadeen, whose report was undisputed. Refuting the points raised by the defense, Manrakhan noted that the absence of DNA of the accused at the scene of the crime does not necessarily demonstrate their innocence. “The expert Susan Woodroffe has also explained that DNA samples can dissolve in water,” said Manrakhan. He pointed out that the autopsy had concluded that the 27-year-old teacher had died due to asphyxia caused by compression of the neck, which excludes the hypothesis put by the defense counsels at certain stages that she died of strangulation by use of a belt or rope. The prosecutor added that it was an act of violence perpetrated on Michaela McAreavey which showed “a clear intention to kill”. He told the jury that a key witness, room attendant Raj Teekoye, had given a statement of what happened on the 10 January 2011 after he had been advised by his wife and his mother to tell authorities whatever he knew about this case. His statement was also reinforced by that of witness Rakesh Seetohul who claimed he had seen one of the accused men heading towards the McAreavey’s hotel room at 2.25pm on the day of the murder, which the other accused was cleaning at the time. Lead counsel argued that when he confronted with the statement of Raj Teekoye, Avinash Treebhoowon knew “that his game was over” and “confessed that he and Sandeep Moonea had committed the crime”. The lawyer said that Treebhoowon’s confession should still be trusted. He refuted the allegation that Treebhoowon’s statement had been fabricated by police. The fact that the former lawyer of one of the accused withdrew from the trial early on and never came to the witness stand to support the claim of his client regarding abuse by the police testifies to the falseness of the allegations, the prosecutor said. He described Raj Theekoye as a ‘trusted witness’ who had ‘no reason to lie’. The counsel for the prosecution also listed a number of reasons he said proved the veracity of the confession of Avinash Treebhowon. The principal state council questioned why Sandip Moneea waited 18 months to say he had been on the phone with his older sister at the time of the murder and said it didn’t appear in any of the statements from the time. The prosecutor denounced the “grotesque tactics” of the defense in trying to blame the husband of Michaela McAreavey, saying that he was the person who had “suffered most in this case”. The trial resumes on Monday with the closing speech of defense counsels. The jury has been instructed not to make any judgment on today’s hearing before listening to the other side of the case. Email “Michaela murder trial told the 27-year-old died by a 'barbaric act'”. Feedback on “Michaela murder trial told the 27-year-old died by a 'barbaric act'”.